As a timber, Oak has proved itself timeless and at JB Kind we have created a sizzling range of contemporary oak door designs that are perfect for on-trend interiors. 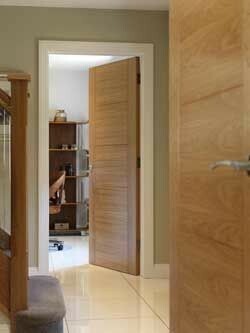 Our variety and choice of quality, affordable, modern Oak door designs really does set us apart. Popular with self-builders, renovators, house builders and commercial contractors, Oak doors accentuate any interior, providing an enduring stylish choice. Many of our contemporary oak doors are already firm favourites with hundreds of customers across the country, like the Mistral Oak with its grooved panels and alternating veneers and the Chartwell with its subtle wenge inlays. Not forgetting the Medina, our sleek glazed oak veneered door with its matching partner and top seller the Tigris. All of our contemporary oak doors are suitable for use within our pocket door systems and each solid design, and some glazed, are available as FD30 fire doors. So as well as saving space, they can also keep you safe! Don’t forget that you can also individually tailor your oak doors with our bespoke door option service too.